"Our biggest fight is against the clock," Correia said. The cyclone has claimed more than 200 lives in Mozambique, 139 in Zimbabwe and 56 in Malawi, officials said. Mozambique's President Filipe Nyusi said the death toll there could climb to 1,000. Aerial footage of the devastation shows acres of land submerged in water, sparing only treetops in what has been deemed one of the most destructive natural disasters in the region's recent history. "People visible from the air may be the lucky ones," said Herve Verhoosel, senior spokesperson for the World Food Program. More than 1.5 million people in Southern Africa were in the cyclone's path, Verhoosel told NPR. "Not a building was untouched. The power lines are down, pulled down by toppled trees," WFP's Gerald Bourke told NPR from Beira, Mozambique. He spoke from the city's airport — one of the few locations with power. "It will take months for the people of the city and the city itself to recover," he said. "There is so much water around [and] the risk of waterborne diseases is obviously very high," WFP's Bourke added. 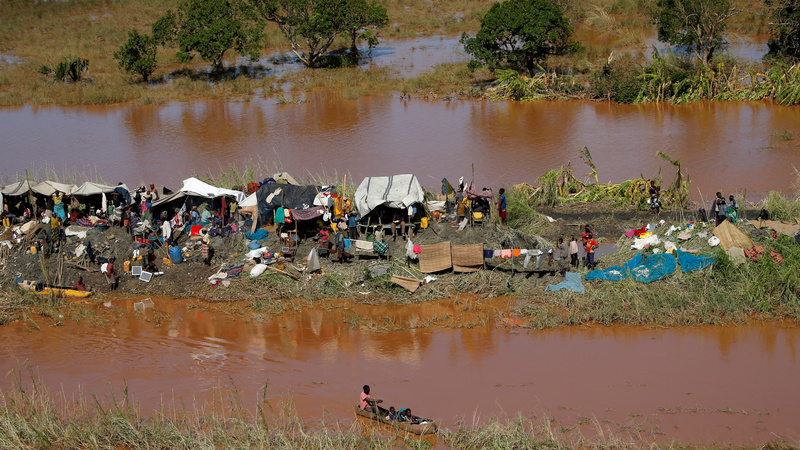 The flooding and displacement of people in the region "significantly increases the risk of malaria, typhoid and cholera," Dr. Matshidiso Moeti, the World Health Organization's Regional Director for Africa, said in a statement. The deluge of water thrust tons of sand from the city's beach and into its streets, further complicating recovery efforts. But Beira's citizens took matters into their own hands to clear the roads. "We saw massive destruction," Jamie LeSueur, emergency operations manager for the International Federation of Red Cross and Red Crescent Societies, told NPR. "But within two days, people were in the streets with shovels. Seeing the response has been just awe-inspiring."